Floppy Disk emulators which can write ! There is not only the "KryoFlux" which is designed to "preserve" old disk formats. There is also HxC Floppy Emulator to the rescue ! 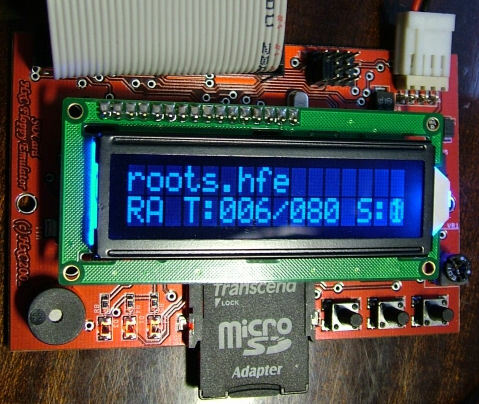 It's a small board with a PIC18F462, uses a SD card as a mass storage, and can be connected through an usual floppy drive cable (34 pin). So the old machine can use this board like a normal (mechanical) floppy drive. 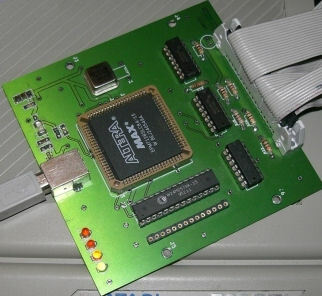 A small board with an Altera MAX CPLD EPM7128S, which in fact is able to emulate the floppy drive with the appropriate "firmware". This device can only read (so far). This device is connected - very user friendly - with the help of USB. 100 years IBM.... do you remember the advertisments about IBM PCs ? 100 years of IBM - that's worth to mention. 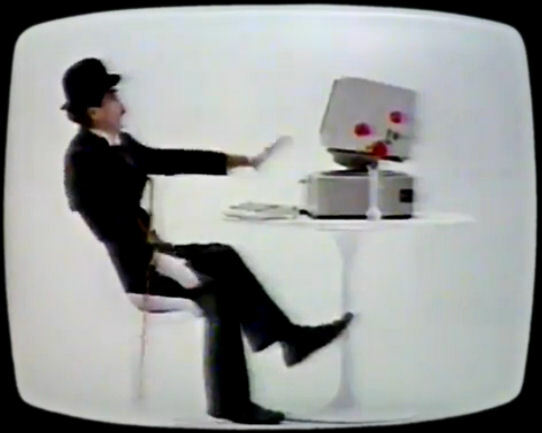 There is also a famous TV spot shown in the Eighties, do you still remember their own version of Charlie Chaplin ? Interesting, the company "IBM" (International Business Machines) was founded 13 years later, in 1924. So far, I got over 100 answers (whow!). Working with an Alpha 21164 64Bit CPU at 433MHz, it sounds not really amazing compared to current PCs (e.g. with an Phenom 6 core processor). But it can run VMS. That's a very old operating system, well known for DEC-10, VAX or similar devices. But it's running also on Alpha based machine since years, and it's known for a high degree of security. And, perhaps, the Digital Command Language (DCL) is one of the origins of CP/M and MS-DOS command processors. At the moment, it's running Windows 2000 Beta 3 (for Alpha of course, not Intel), which is quite stable running. It can run also x86 code with the help of FX!32 (see related link). To obtain VMS, you have to go to openvmshobbyist. At the moment I am waiting for more time, also because the license is limited and getting it without working with it sounds crazy. Also, with a PWS 433a you have to add a SCSI CD-ROM and harddisk first, otherwise you can't run OpenVMS. May be I try OpenBSD first instead for that reason. A very interesting link for Alpha users is also a blog - virtuallyfun.blogspot.com. As you know, I set up a virtual machine with Windows 98 SE ... INTERSERVER was running. But the connection between the two computer can't be established. May be it was not only related with the Nullmodem-cable but also with missing handshake signals. I don't know. But I remembered my SRAM PCMCIA card which I used in my Amstrad NC100... I inserted a fresh lithium battery and then inserted the card into my Highscreen organizer. I was able to format the "IC Card" (the memory card) and also was able to copy files onto it. I had to search for a driver first. I got one at the transcend website ( http://www.transcend.nl/support/dlcente ... _Win2k.exe ). The drive itself was mounted, but the format of the media was not recognized. So I had to use Cardware Software to get a raw image from the PCMCIA memory card. A trial version can be downloaded at http://www.tssc.de/download/prods/cw2k.exe . After having a raw image of the pcmcia SRAM card, I was able to use WinImage to read (and write) files from (or to) it. It was not possible to read or write the card with Windows XP only. May be it's related with FAT12. 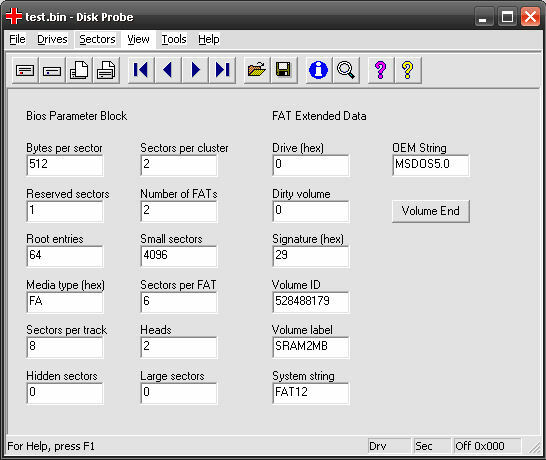 You can't even FORMAT FAT12 media via Windows XP. 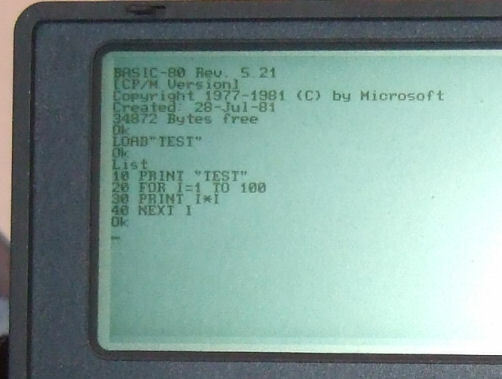 Ok, anyway, I managed to get 22NICE (1.42) to the Pocket PC, but also Turbo PASCAL 3.0 and BASIC for CP/M-80. With the 22NICE utility "GENCOM" I was able to generate appropriate loader .COM files for the CP/M-programs, so finally I was able to run CP/M-80 programs on the device. And the speed is at least similar to a Kaypro IV, means enough for serious work. TCP/IP stack for CP/M based systems ?